Sandblasting is a generic term for the process of smoothing, shaping and cleaning a hard surface by forcing solid particles across that surface at high speeds, such as sand or glass particles. The effect is similar to that of using sandpaper, but provides a more even finish with no problems at corners or crannies. 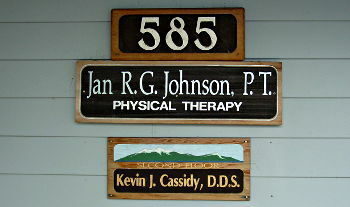 The result is a beautiful three-dimensional sign with raised letters and features that will last for a very long time. We created and sandblasted many signs for the City of South Lake Tahoe. These are beautiful creations that tie the Senior Center, Ice Arena, Campgrounds and Recreation Center together. The Tahoe Keys Association requires all signage to be sandblasted redwood in order to fit the natural feel and look that sandblasted redwood signs offer. We specialize in sandblasted redwood signs of all shapes and sizes. We can even sandblast all types of natural stone. This particular project involved sandblasting and finishing the recessed lettering with a Gold Finish. The ultimate for Tahoe's Elite.